Diwali: the Indian festival of light, family, love, truth, knowledge and beginnings. In 2000, I started working with a group of Accenture Indian and global leaders to start our first international Indian delivery centre, providing technology services to Accenture clients. Our beginnings were modest. We converted a factory in the northern suburbs of Mumbai into a 200 seat development centre, surrounded by pleasant grounds that seemed distant from the everyday turmoil of that great city. We started work in 2001 with just 2 clients, and by the end of the year we had hired around 70 people. It was the start of an epic journey. It was my pleasure and privilege to be deeply involved with our Indian delivery centres until the beginning of 2014, when I moved into a new phase of my own career. Along the way, I made many, many Indian friends and colleagues, delighted in the way that India created employment and opportunity through digital technology and began to absorb just a little of its vast and glorious culture. We saw India become a natural part of the global economy, connected to businesses everywhere. As a group, we learnt about hyper-growth, transformation, scale and working as a global team around a common culture. And at the start of 2014, our Accenture Indian team had opened in seven cities, made Bangalore the biggest location in Accenture and grown to more than 110,000 people. It the the great foundation of Accenture’s Global Delivery Network, and only just a teenager. A little before, we had held a great party to mark that success, rooted in our small beginning. And of course, now it is Diwali – the festival of light that marks family, love, truth, knowledge and beginnings. It has also become a symbol of India – ancient and modern, a nation of villages and digital tech – that is celebrated across the world. In India itself, before the key celebration, people will decorate and clean their homes. The main Diwali night is a time for wearing new clothes and lighting the diyas or lamps that give the festival its name. Then, in a traditional household, prayers are offered to Lakshimi – the goddess of wealth and success. Fireworks and the sharing of sweets will follow. There are many stories and legends around Diwali, but overall it always signifies the victory of light over darkness, knowledge over ignorance, good over evil, and hope over despair. It is a time of cleansing, forgiveness and new beginnings. So, a simple Diwali message is for all my Indian friends, those from India, those who love India and those who miss India: Happy Diwali – Shubh Deepavali – to you, your own friends and your families. Whatever your own beliefs, I hope the next twelve months is a time of new starts, new connections and opportunities, new achievements, and success. Published author and active film producer, including Last Man on the Moonand Dying Laughing. Advisor/investor for web and cloud-based start-ups. I’ve spent much of my career focused on how to plan and manage one of the most precious and complex resources: time – and especially how time relates to project scale and complexity. In software development and technology-driven business projects, one of the clearest and most dramatic trade-offs is between speed and cost. There is a simple rule: the shorter the schedule, the bigger the total effort, and associated cost. The dynamics of organizing and connecting people around common processes will become increasingly stressed when time is tight. The scope for error and rework increases significantly. Indeed, there are schedule and scale combinations that are simply impossible to achieve, for which – to coin a phrase from the great Fred Brooks – there is no silver, magic bullet. Rome, an Olympic stadium, and even average size software projects cannot be built in a day. When faced with demands for impossible schedules, where the balance of scope and schedule simply do not fit, I normally take people through the complex dynamics of time and teams. I stress the need for a proper amount of time to understand a business and develop a design, and the option of delivering function in iterations so that some benefit can be gained earlier. Five years or more gives enough time for big change, enough time to create a business or even a market. One personal example of that is when I was part of the team that founded Accenture’s India Delivery Centres in 2001. We had a short-term plan focused on 200 people, but I also drew out a longer-term plan on a whiteboard that spanned three to four years and would get us to 10,000 people in multiple cities. It captured our strategic intent. We would meet both plans. However, there are times when magic will work, when external events demand a schedule that is improbably short and – even more remarkably – the right team with the right motivation and the right support achieves that timescale. Such moments can create real belief in a program or team, leading to greater success at ever larger scales. The insights learned from these experiences can also help people think through agility, an increasing demand from many senior leaders in our hyperactive era. So, it is those moments when teams move with the lightning, when great things are done fast, that I want to explore in what follows. Let’s start with the inspiration for this article – a spaceship. I was researching the history of NASA Mission Control. This was for a potential film project, and also out of simple curiosity about how the great and mighty NASA machine of the 1960s and early 70s was created. One of the key sources is the book Flight: My Life in Mission Control by Christopher Kraft who conceived and built the first versions of NASA mission control. It is a book that tells the human and organizational story of the space program, and one I would recommend to any student of delivery. The following sequence jumped out at me, around the Request for Proposal or RFP process for America’s first manned spacecraft – the Mercury capsule. By today’s standards, this is extraordinarily fast. It is genuinely astounding. This is not the RFP for an IT system, or office supplies. It is an RFP for a spaceship. In a matter of weeks, the direction for America’s first manned space program had been set and a partner selected. The Mercury program had initial challenges – such as an infamous unmanned flight that reached a height of 4 inches – but overall it succeeded completely, and with the knowledge and expertise created America would reach the moon less than 11 years after NASA was created. This incredible example demonstrates some of the themes we will explore later in the article: strong mission, strong leadership, great skills and motivation. Above all it shows that there are times when great things can indeed be done quickly. This example is not nearly so grand. It didn’t change broad history, but it did help create a major technology delivery centre, and a new business. It was, by normal corporate standards, a magnificent achievement. We had started our new business in a charming, worn art-deco style building beside the Thames. We were in the midst of a major software development, with 300 people designing, developing and testing releases of a major software product. The work in total was tens of thousands of days. Testing in particular is very sensitive to environment – the software configurations, networks, workstation and server technology need to be absolutely correct, and the physical space needs to support intense teamwork on the grand scale. Although the building faced the river, it was cheap to rent. And the reason it was cheap – which I didn’t know at the time – was that there was a one-month notice period in the lease. Our facilities people had deemed it unlikely to happen. Their judgement was usually faultless, but this time they were wrong. The owner wanted to rebuild, and start demolition soon. So, one day we faced just over 3 weeks for a move – with no target future building and no plan, and 300 people working hard on a tough schedule for multiple clients. As we expanded, we would develop true business continuity and would be able to handle loss of a facility with ease, but this was early in our history. We had an immense problem. The first task was not to panic, or analyse quite why we were where we were. As we have seen in previous articles, status is to be understood with blunt honesty, and issues are there to be managed. As for the next task, I asked a true Master of Delivery – “RK” – to plan and execute the move. RK had an exceptional grasp of the full technology stack – from the wires to the complex distributed software environment. He also understood what an objective meant, and would work with enormous passion towards that. I asked him to target just one day – the move day – of down time for the team. RK smiled. So, we created a plan around a number of parallel strands that RK would operate with complete authority. Strand 1 was creating the mission, and instilling a sense of belief about the date. We wanted people to feel that their efforts would help make a little corporate history. Strand 2 was about people. We staffed key roles immediately with some of our best, taking a short term hit on other activities. We chose those who had general management skills, and precision, since we needed delegation to be effective. We would expect everyone to be hands-on – acting much like people do in start-ups. Strand 3 was a search for a suitable empty space. We looked in what in London is called mid-town, between the West End and the City. It was less fashionable then than it is these days, and we found three spaces of the right scale and cost. Two were dreadful – cramped spaces in out-dated concrete buildings, that would require much work. One, however, was acceptable. This was the key piece of luck we needed. We had found our future home – an Edwardian building near London’s legal district. Strand 4 was design. We established the minimum design around building layout, furniture, a LAN, working servers and wide area communications. That was placed under firm control. Any change would be reviewed carefully. Strand 5 was to focus on logistics with true military precision. We analysed lead times, placed orders – leased and borrowed equipment that wouldn’t arrive on time – and asked our suppliers to make the extra effort to support us. And then, came the daily grind of execution. We met the deadline, and had people working effectively on the first day of operation of the new building. We lost only a few hours of productive work. And it turned out that the technology design was not only effective … it was near perfect. RK had poured all his knowledge into the design, and we had no time for the usual compromises. This is an example that I come back to repeatedly in my thinking, a key moment in my experiences in creating large delivery centres in India, and a lesson in how to get teams to do incredible things. We had been in operation for around 18 months, reaching 500 people. This had required sustained effort since our business was then not widely known among our target talent pool. We had worked hard with candidates, even explained ourselves to their families, and organized dedicated training and conference days to attract people to apply. Overall, with a little difficultly, we had balanced demand and supply effectively. Our HR team had made a brilliant start. Now things were changing and demand was increasing. We were beginning to see supply challenges. I wanted to understand trends – I always want to understand trends since part of any leadership role is looking ahead – and went through the data in detail. The reason for the new demand for people was a large, recent increase in active and potential clients. We had established a successful business. We were seeing the early days of a much larger future increase – the work at each new client would likely grow, and need more people. We had reached a tipping point. Roughly speaking, we were seeing the beginnings of an exponential, non-linear trend. Most people will naturally plan around linear and steady change, but with positive feedback, human enterprises can go through remarkable and fast changes – creating echoes of the growth of the Internet, the progress of a hit single, or viral video. The topic of exponential, human change is a topic I will be returning to in later articles. The good news was that we had what seemed to be the start of a tremendous opportunity. The bad news was that we needed a non-linear response. We had a talented local leader who was strong, charismatic and a true business builder. Our local HR lead was one of the most positive and dedicated professionals I have ever had the privilege to work with. They had been carefully chosen, and in their different ways they were both Masters of Delivery. They would go on to make very major contributions. I asked them this. Although, it has taken eighteen months to grow to 500 people, we need to hire 500 people in the next five weeks. Can you do it? Those who have built and worked in start-ups know how hard an ask this was. Talent is the key resource and often the key constraint. And the mood of that meeting? When a world of pain and hard work was opening up before us. It was tremendous – full of energy and laughter. They had that “can-do, will-do attitude” Chris Kraft had seen at NASA. They went for it. We briefed the team … making it their moment of making history. We hired good contractors to support the core professionals. We arranged for virtual interviews from people across the globe. We created a large war room, dotted with white boards to record real-time status. And then we filtered CVs and held interviews, thousands and thousands and thousands of times. By the end of the period they had made 526 offers to good candidates. They had beaten the target. They had made their own piece of history. And after that, the team knew what they were capable of, and created one of the best large-scale recruiting engines in India, eventually capable of hiring many thousands a month. So, what general threads can we pull out of my three very different examples? When can a leader or business ask for remarkable efforts in a remarkable short time frame? My conclusions are as follows (although I would also be delighted to hear your thoughts). They are similar to the Ten Commandments we saw in Episode 2 of Masters of Delivery, but tuned completely to very rapid execution. This cannot be business as usual. Remarkable effort should be reserved for times of remarkable need. The examples we have looked it where against the background of the space race, or clear, urgent, business challenges. But in such times, it will sometimes pay-off enormously to have ambition and the courage to ask for that remarkable effort. The work can be undertaken by a small number of experts. For example, it was possible to create a high-level spacecraft design in weeks. Building the spacecraft would take another two years (superb in itself). Or the work can be scaled and duplicated across people and teams – as in our recruiting example. It is self-contained, with few external dependencies. There must be a clear mission, a worthwhile purpose. This must be communicated to everybody. And people enjoy doing great things; enjoy making their own pieces of history – so communicate to inspire. The mission must be understood, valued and supported by the team. It’s hard to ask people to work long hours. It is much easier and much more effective to ask them to work for a goal. Assign the best team. It is remarkable how many projects fail, even mission critical ones, because hard choices about resources are not made. When timescales are fundamental, staff your best people and clear their decks. Less urgent issues will wait. And “best team” means people with experience – in every one of our three examples,the teams were led and staffed by people who had prior experience of great relevance. Above assign a qualified leader – a leader and subject matter expert – and concentrate authority in that person. Create a simple plan, simple reporting – whiteboards can be the most powerful tool for management – and a simple decision making process for issues and changes. Look after the team – get the key stakeholders or senior executives to spend time with them, deal with food and transport issues generously, give them support staff without hesitation. This little article arose from a simple greeting I made to ”all those who live in, love and connect with India”. 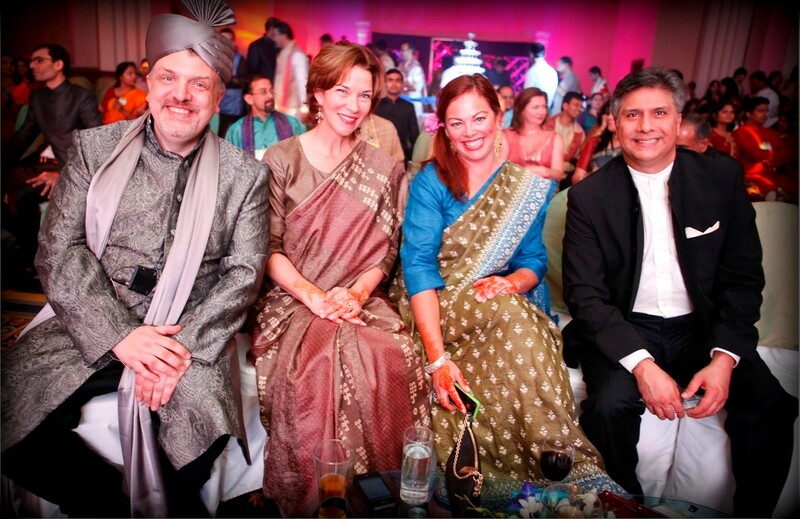 It was especially meant for the great many friends I had made while working with India in the last decade and a half. I made my greeting via very simple Facebook and lLinkedin messages on the proper day , August 29th 2014. The message was Happy Ganesh Chaturi. Ganesha Chaturthi is the Hindu festival celebrated in honour of the god Ganesha, the elephant-headed god. In business in India, and in particular when non-Indians met Indians for the first time, a model of Ganesha is one of the most common gifts. (I can see three such models in my own office as I type this). With a couple of days I had received more than 200 likes and quite a few return greetings. It was probably seen by well over a thousand people and although it couldn’t really be described as going viral, I was touched that it had struck a cord. I also noticed that many of the greetings I received were from non-Indians, mainly those who had some link with India’s hugely important IT industry. The start date of the festival typically falls between 19th August and 20 September, varying according to the exact phase of the moon. Clay images – sometimes of enormous scale and ornateness – are kept in temporary shrines, and then with great pomp, they are immersed in water. This is especially popular and elaborate in Maharashtra and other parts of Western and Southern India. It seems great fun, although with true meaning. Ganesha is a positive symbol. He is the Lord of success and destroyer of evils and obstacles. He represents quite a lot of other good things, such as education, knowledge, wisdom and wealth. But more than that – precisely because images of Ganesha are given so many times as gifts between Indians and non-Indians – Ganesha now represents connection between cultures, and modern India itself – a vibrant, complex country that is taking its place in the world. Of all the Hindu symbols, it is Ganesha that is the most known outside India and its diaspora. So for all of you connected with India, and a little late (although my original greeting was on time), here is to a Happy Ganesh Chaturth, and success and auspicious beginnings for you all. Ganpati Bappa Morya. Keith Haviland is a business and technology leader, with a special focus on how to combine big vision and practical execution at the very largest scale, and how new technologies will reshape tech services. Former Partner and Global Senior Managing Director at Accenture, and founder of Accenture’s Global Delivery Network. Published author and active film producer, including Last Man on the Moon. Advisor/investor for web and cloud-based start-ups. The image “Ganesh mimarjanam 2 EDITED” by Vijay Bandari shown with this article is licensed under Creative Commons Attribution 2.0 via Wikimedia Commons.